As you approach Parham through the soft folds of her parkland landscape this fine Elizabethan house reveals herself in a timeless and welcoming way. It is five years since I wrote my first column and I am returning to where I began. I love revisiting this remarkable place and today I am rewarded by the sight of Parham’s stone walls glowing in the light of the first spring sunshine of the year. The house sits comfortably in the landscape against the backdrop of the Sussex Downs. There is an excitement in the air as Parham’s team busy themselves with the final preparations before welcoming the first visitors of 2018 this coming Easter Sunday. Parham, with its beautiful rooms and collections, is no ordinary historic house but a home which gathers its visitors in a generous and unique way thanks to Lady Emma’s particular qualities. Together with her husband, James, Lady Emma has brought up her two boys here and the family’s fondness for this place gives it real life. We set out to see how the preparations are progressing and pause at the top of the house in the light filled Long Gallery with its wonderful ceiling. Lady Emma explains that the ceiling was put in by the Pearsons in the 1960s. There were no historical records of the Elizabethan original so they commissioned the theatrical artist Oliver Messel to design it. In the grounds to the south of the house, beyond the ha-ha, is St Peter’s Church where I will be taking the Easter Sunday service of Holy Communion this year. It starts at 9.15am and all are welcome. The church remains open all day. Parham House and Gardens open this Easter Sunday April 1 2018 at 2pm and 12pm respectively, closing at 5pm. 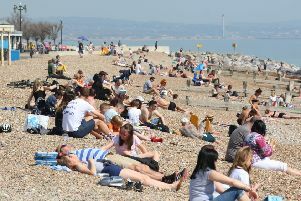 For more information go to www.parhaminsussex.co.uk or telephone 01903 742021.